Every year around Daylight Savings, we like to adopt the weekend mantra “Namast’ay in Bed.” With experts reporting this year that the days will be even shorter than in years past, we’re gearing up for long, lazy weekends under the sheets. As such, Gwen and Lindsey are sharing the lounge essentials they love to recharge with on their days off. 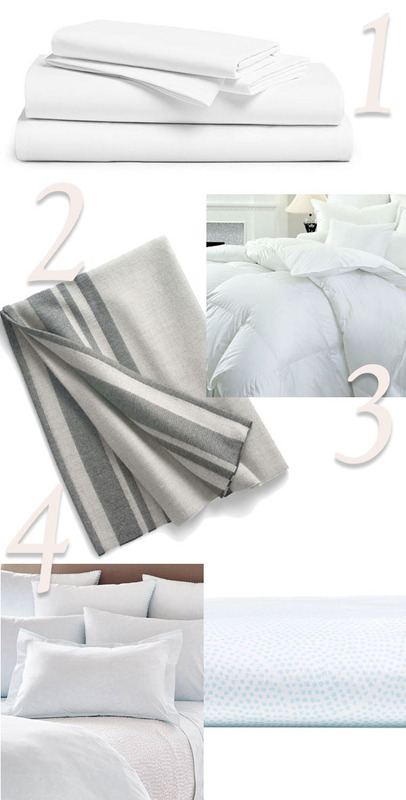 Crisp, clean sheets top Gwen and Lindsey’s favorite things list any day. These 100% long-staple cotton sheets from Brooklinen are the things dreams are made of. Tip: Be sure to wash sheets before use. To tackle sheet stains, visit our how-to here. Constructed of baby alpaca fibers, derived from the soft, downy hairs of alpaca, this throw is the perfect cozy companion for Netflix binge sessions or a good read. Tip: Care for your alpaca pieces at home using our how-to here. Warmth without weight makes this down comforter a family favorite. Generously sized and woven in Germany, it’s also ecologically certified, meaning a healthy night’s sleep (or longer winter nap)! Tip: Follow our guide to washing down bedding and duvets here. This dreamy duvet is woven in India of 400 thread count pure cotton percale, meaning it's durable, yet exceptionally soft. The patterns and colors, subtle or bold, make it easy for anyone to find the bedding that suits them. A cashmere eye mask… enough said. What more could you want? 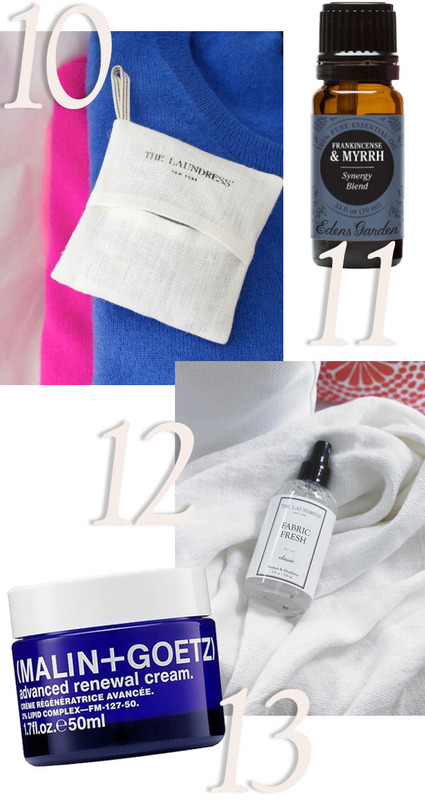 Tip: You’ll want to keep your cashmere clean, especially an eye mask that is in regular contact with your face. Follow our care guide to laundering cashmere at home here. This lightweight cotton robe is comfortable without the bulk and perfect to pack for traveling too. This is the kind of robe you want to spend all day in – classic silk with a flattering cut – an effortlessly chic lounging look! Tip: Laundering silk can feel intimating at first, but once you master a few simple techniques, you’ll never want to dry clean again. Follow our step-by-step guide here. 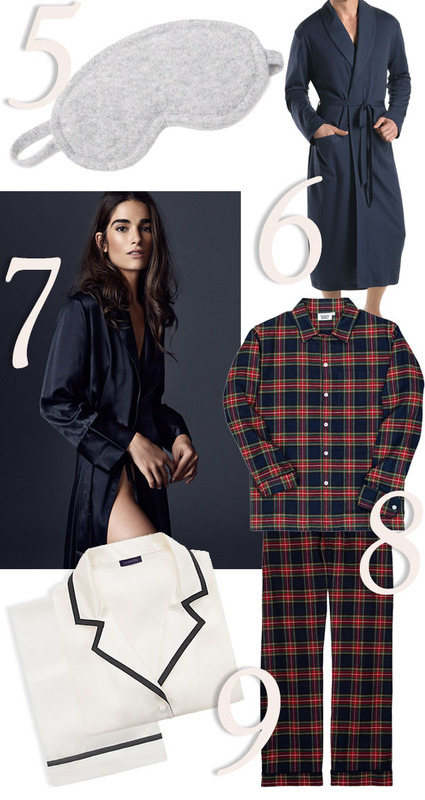 You can’t beat classically tailored cotton pajamas on a breakfast (and maybe even lunch and dinner) day in bed! We love this preppy plaid print. Another favorite of The Laundress from Journelle, these silk pajamas with tuxedo trim feel just as good as they look with a weighty luxe drape we can’t get enough of. The intoxicating scent of dried lavender immediately puts us into relaxation mode. Throw one in your linen closet for a gentle fragrance or toss it into the dryer with your clean laundry for an extra boost of scent. This restorative oil is known for its healing properties, including the relief of chronic stress and anxiety, pain reduction, as well as controlling inflammation, and boosting immunity. Keep this beside essential close at hand so you can spray sheets and bedding with Fabric Fresh Classic to freshen and add the ultimate “clean laundry smell” before falling into bed. Look like a million bucks after a long winter nap! This super hydrating cream nourishes skin that can become parched by winter air or indoor heating. Layer on your skin to improve elasticity and reduce the appearance of fine lines while you rest.